We are always amazed by the generosity of Grange and community members who give of themselves each year. This past year over 101,000 hours were give to better our communities and beyond. That's right 101,000 hours. What an impact on those you helped. 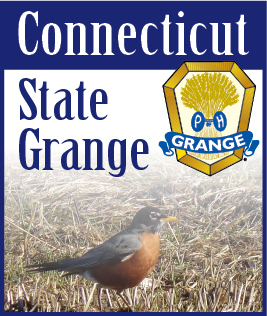 We are pleased to report Prospect Grange received first place for their report for Granges with members 50 and under, and Ekonk Community Grange placed first for grange 51 members and above. Ekonk Community Grange was awarded "Best in Show" by the judges. As the holiday season approaches now is a good time for your Grange to reach out to those in need or those who just need a little lift. Remember, sometimes little project, or simple acts of kindness make a greater impact than large scale projects. There are many was to give a little extra this year, we know finances for many are slim, but just visiting a shut in and being a friend to someone is all it takes. Simple acts of kindness, that's it. You will lift someone's spirits and you too will feel like a million bucks. True kindness costs nothing. It is our goal for 2010 to have 100% of all Granges submit a completed Community Service Report. We will be recognizing all Deputies who's Pomona has 100% reporting at the next State Session. As we stated earlier 35 Granges reported over 101,000 hours, we are excited to see what this number looks like with every Grange reporting their hours. What a statement to the public that will make. It will truly show them we are here, we are relevant, and we are working, and working hard for each community to which each Grange is connected.